Fine Roto Graphic was established in the year 2011. We are leading Manufacturer and Supplier of Photo Engrave, Gravure Cylinder, Pharma Printing Roller, Printing Roller (B.O.P.P). We have acquired a respected position in this business arena only because of our customer-centric approach and strong belief in quality of our assortment. We are offered with sensible price keeping customer's budget in mind. Thus, customers prefer us to meet their distinct requirements that make us the front-runner in the competitive market. We lay a strong emphasis on our clients and channelize all our endeavors towards providing superlative products to understand our clients and their problems regarding the usage of our products. We provide after sales services through this value added service. We are able to reduce the problems related to the operating process of our equipment & components, and any other faults or complexes in the products. 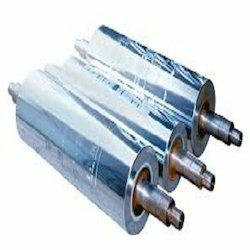 Printing Rollers that are used for high-volume printing of packaging and wallpaper etc. These optimum quality printing rollers are manufactured using high grade basic raw materials in compliance with set industrial standards.